These photographs are from a number of trips, 0ne in the summer of 2004, and another as part of a cruise in 2006 where I used digital cameras. The biggest difference in the quality of the photographs is my use of a DSLR in 2006 versus a Konica-Minolta bridge camera in 2004. You can take great pictures with fairly unsophisticated equipment, but the same pictures with a DSLR are far superior. By the way, does it get any better than Italy? I have included some photos when I was using film in the late 90's and early in 2000. For a number of the shots, I used Topaz software as well as Nik Color Efex, both very powerful plug-ins that allow me to alter reality, so to speak. There are attempts at fake HDR (High Dynamic Range) that occasionally work. I am having a great time working and reworking these images with this new technology. #63 Burano, Italy, July 2004. For me, Burano remains the single most enjoyable area of Venice to photograph. 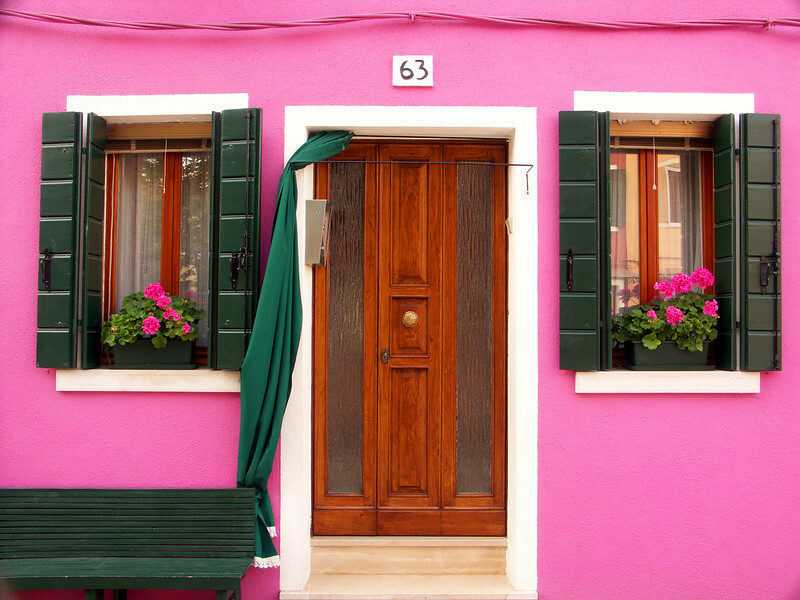 The island lies about a 45 minute vaparetto ride from Venice, and contains hundreds of brightly painted houses. It is said that the houses are painted to give sailors returning from the sea a visual cue that they were near home in bad weather.